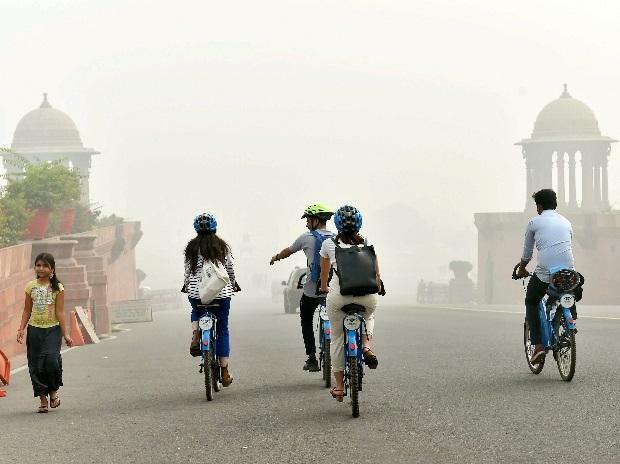 Air quality will be in moderate to poor category till February 17,"
The air quality in the national capital improved on Friday and was recorded in the "poor" category due to rain in various parts of the city that washed out suspended particulate matter (PM), authorities said. According to data provided by the Central Pollution Control Board (CPCB), the overall air quality index (AQI) of Delhi was at 249. The CPCB said 26 areas in the national capital recorded 'poor' air quality, while only in one area it was 'severe'. The level of PM2.5 (particles in the air with a diameter of less than 2.5 micrometres) was recorded at 107 and the PM10 level was at 167, it said. In the National Capital Region (NCR), Ghaziabad, Greater Noida and Noida recorded 'poor' air quality while Gurgaon had 'moderate' air quality. Authorities said the overall air quality is likely to improve to 'moderate' by Saturday. "Rain scavenging of suspended particular matter has contributed towards the improvement of the region's air quality. The slow improvement in "AQI" despite of good rain is mainly due to isolated rainfall in different pockets. "Air quality will be in moderate to poor category till February 17," the Centre-run System of Air Quality and Weather Forecasting (SAFAR) said. It said the air quality is expected to slightly deteriorate Monday onwards.